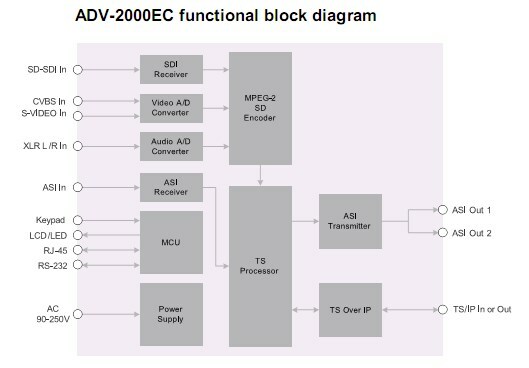 The ADV-2000EC is a real-time single program 4:2:0 MPEG-2 encoder. It supports analog and digital audio/video inputs such as: CVBS, S-Video and SDI. The ADV-2000EC has an ASI input port and a built-in multiplexer which can re-multiplex the encoded SPTS with an external MPTS and generate a new MPTS which can then be sent to either ASI or IP output. Control of the ADV-2000EC is done through either a web interface, front panel, or by using SNMP. Useful bit rate 70Mb/s min.